14 Club members enjoyed a 5.5 mile walk around the Lyme Regis boundary along footpaths and lanes not usually walked by visitors to the town. The group started with an hour’s photo shoot on The Cobb, at the harbour and seafront, followed by a brief visit to The Mill. The walk proper commenced here by joining The East Devon Way alongside The River Lim, the path gradually rising to the village of Uplyme. Following a visit to The Parish Church with its 1000 year old yew tree, lunch was enjoyed at The Talbot Inn, the 45 minute scheduled break extending to 75 minutes due to the chef offering irresistible desserts and cakes to the ladies. 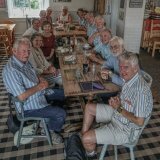 Having prised members from their comfortable seats the walk continued via lanes to the old concrete Cannington Railway Viaduct and then, crossing fields, climbing up a very steep but short narrow path, (the only strenuous section on the route), the group arrived at Ware. From there it was then a pleasant walk down into Lyme and to the car park but two of the group decided to leave the main party to go back to The Cobb. Within 2 minutes they were lost, calling for help, and even now may be lost, wandering the town’s hillsides, if guidance hadn’t been given! The weather was kind throughout, and 12 of the party returned to Sidmouth tired but happy.